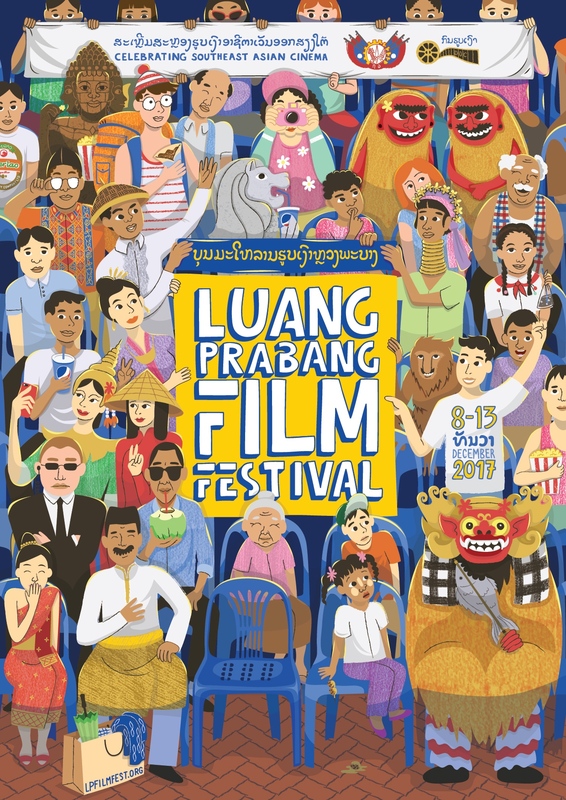 The Luang Prabang Film Festival (LPFF) concluded its eighth annual event last week in the UNESCO World Heritage town of Luang Prabang, Laos, with the Audience Choice Award going to the Malaysian film, Redha. The Audience Choice Award was decided by a 5-star online rating system, for which viewers could submit their rating of a film following its screening. This year’s winner, Redha, follows the story of Alina and Razlan, who discover that their only son is autistic and must confront the harsh realities of raising a child disabled by a condition they hardly know about. The film was directed by Tunku Mona Riza, who attended the festival for her screening and participated in a Q&A with the audience as well as a public discussion on Muslim Voices in Southeast Asia. The festival, which has the mission of celebrating Southeast Asian cinema, ran from Friday, 8 December to Wednesday, 13 December. In addition to screening 32 feature films and four programs of short films, LPFF put on four public discussions and several performances. Official selections are made by experts and critics from across Southeast Asia referred to as “Motion Picture Ambassadors,” and represent a carefully chosen collection of what they believe to be the finest contemporary films from their respective countries. By identifying great curators with inside understanding of their community’s film scene, LPFF is able to produce a unique program that ensures in the inclusion of the strongest voices from across Southeast Asia. Not only is LPFF a celebration of the finest Southeast Asian cinema, it has become well known as a unique forum for regional film professionals to network internationally and to exchange diverse ideas and experiences. In LPFF’s commitment to accessibility, all screenings and activities of the festival were free and open to the public. LPFF’s four programs of short films included: a selection from the 2017 Vientianale Short Film Competition that showcased budding talent in Laos; Thai shorts to complement the festival’s SPOTLIGHT country (see below); the top films from a Youth and Agroecology Short Film Competition held by LPFF and the Agroecology Learning alliance in Southeast Asia; and recent award winners on Viddsee, an online video platform featuring short films from across Asia. There were also several major public discussions this year for visitors of the festival, including the aforementioned discussion on Muslim voices in Southeast Asia, featuring Harlif Mohamad and Nurain Peeraya, the Bruneian directors of Rina 2; Sheron Dayoc, the Filipino director of Women of the Weeping River; Tunku Mona Riza, the Malaysian director of Redha; and Kong Rithdee, LPFF’s Motion Picture Ambassador for Thailand and writer of The Island Funeral. Rithdee also hosted this year’s SPOTLIGHT on Thailand, with a full day of programming devoted to screenings and discussion of the issues facing Thai filmmakers today. Delegates from the Royal Thai Embassy in Vientiane were in attendance and several Thai filmmakers participated, including Anocha Suwichakornpong (By the Time it Gets Dark), Sompot Chidgasornpongse (Railway Sleepers), Boonsong Nakphoo (Wandering), Laddawan Rattanadilokchai (The Couple), Sakchai Deenan (The upcoming Memories of New Years), and Sanchai Chotirosseranee (Thai Film Archive, representing Santi-Vina). Also occurring during the festival was the second iteration of the LPFF Talent Lab for Southeast Asian filmmakers, led by the Tribeca Film Institute® (TFI), with 10 participating film projects from 6 ASEAN nations. The Lab, which focused on grant writing and project pitching and was extended to two days this year, included a pitching workshop led by Bryce Norbitz and Molly O’Keefe from TFI. Following the workshop was a pitch forum with feedback from a jury comprised of filmmaking professionals from around the world, including Jeremy Sim of Singapore-based media investment firm Aurora Media Holdings; Kenneth Lipper, the Oscar-winning American producer; Victor William of ROKKI, AirAsia’s in-flight entertainment provider; and Ho Hock Doong and Siti Helaliana Chumiran, both from the Malaysian distribution company, Astro. After deliberation, the jury selected the Lao-Filipino collaboration Raising a Beast to attend the TFI Network market, which will take place in New York City at the 2018 Tribeca Film Festival®. There, TFI will arrange meetings for the filmmakers with editors, distributors, and financiers. TFI will then mentor the Raising a Beast team through the completion of the project. Written and directed by Xaisongkham Induangchanty (Laos) and produced by Abigail Lazaro (Philippines), Raising a Beast tells the story of two Hmong siblings, Ying and Neng, who are blessed with beautiful voices and dream of moving to the city to become singers one day. When their father refuses to sell the family’s prized bull to help pay for Neng’s education in the city, Ying becomes a bull trainer to cover her brother’s expenses. Another big winner at the Talent Lab was the Filipino project Cat Island, pitched by Siege Ledesma (director, writer) and Ang Alemberg (producer). Jeremy Sim and Aurora Media Holdings selected the project to receive its Aurora Producing Award of $10,000. Cat Island follows Catherine, who after dedicating almost two decades of her life to the care of her asthmatic, albeit feisty and cat-loving mother, finds herself alone and purposeless when her mother dies. On the eve of her 40th birthday, the ghost of Catherine’s mother returns to ask for Catherine’s help in completing her “unfinished business”: have her remains cremated and scattered over Cat Island, Japan. With a renewed sense of purpose, Catherine travels to Japan to complete her mission on the rural island. A new addition to the festival’s program this year was a documentary production workshop organized by the US Mission to ASEAN and the American Film Showcase. Renowned Filipino-American filmmaker Ramona Diaz (Imelda, Don’t Stop Believin’: Everyman’s Journey) and Patrick Shen (Flight from Death: The Quest for Immortality, The Philosopher Kings) led a five-day workshop with 14 participants from the Young Southeast Asian Leaders Initiative. At the end of the workshop, four short documentaries made in small groups by the participants throughout the week were presented following a screening of Diaz’s most recent film, Motherland. LPFF offered five live evening performances on its main stage before headline screenings at its Night Venue, the Handicraft Market at the main intersection in town, including concerts from popular Lao singers Touly and Ola Black Eyes. These performances are an opportunity to nurture young talent, and offer a platform for these performers to showcase their talents to an international audience. 22 of this edition’s 32 feature films had directors, producers, writers, or actors in attendance, all of whom participated in Q&A sessions after the screenings of their films. Between screenings, filmmakers and other industry professionals mingled in the Beerlao Director’s Lounge on the top floor of Indigo House, where they could enjoy complimentary Beerlao Gold and take in the view of the Night Venue. On display was an exhibition of photographs from Myanmar from the lauded Southeast Asia Movie Theater Project, accompanied by an exhibition walk-through by the initiative’s founder, Philip Jablon. As a reprise to his trip there over five years ago, Jablon spent February and March of last year researching and photographing movie theaters in Myanmar, a nation experiencing an overall rebirth of cinema-going. Once again, the festival was proudly supported by its biggest sponsor, the Lao Brewery Company with three of their brands coming in at the Platinum Level: Beerlao, Pepsi, and Tigerhead. Other generous supporters of the 2017 festival were the US Embassy Vientiane, the Asia Foundation, the Bennack-Polan Foundation, Chillax Productions, Embassy of the Grand Duchy of Luxembourg in Laos, Exo Travel, Sofitel Luang Prabang, the Nam Theun 2 Power Company, Princeton in Asia, the Royal Thai Embassy Vientiane, Indochina Productions, the Delegation of the European Union to Lao PDR, DK Lao, Theun-Hinboun Power Company, NP Service & Design, Final Draft, and the Asia-Europe Foundation. For more information on the festival, visit lpfilmfest.org or stay up to date at facebook.com/lpfilmfest.